Ridgeway, Colorado; (elevation: 6988 feet) was the staging site for many of Hollywood’s best known Westerns including “How the West Was Won” and “True Grit”. Only 37 miles from Telluride Ski Resort, it is surrounded by gorgeous, rugged mountain terrain. 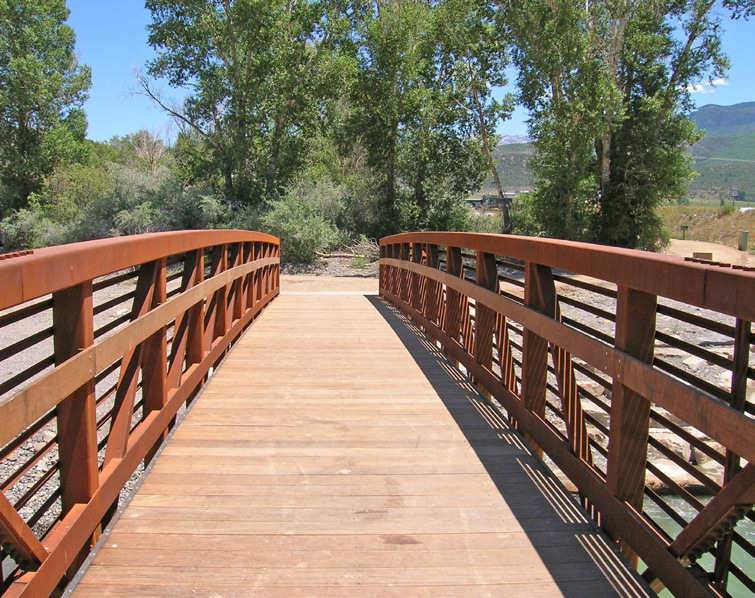 The Uncompahgre River runs through Ridgeway, offering a playground and a nature trail. The Town of Ridgeway was constructing a recreation trail that parallels State Highway 62 and crosses over the river’s fast moving waters. Engineers for the project, Buckhorn Geotech, Inc., faced some unique challenges with the site. In particular, the difficult footing made it necessary to drive steel pilings 40’ deep for each abutment. The Continental ® weathering steel pedestrian truss bridge is over 108 feet long and is eight feet wide. The decking is lpe hardwood, a Brazilian species that is one of the most stable of all the durable timbers. It dries extremely well with little checking, twisting or bowing. It is a heavy timber, approximately 64 lbs. per cubic foot when dry, generally sinks in water, and has a fire rating of Class A, the same as concrete or steel. Ipe has many commercial names and is sold as Brazilian Walnut, Bethabarra and other trademark names.